The idea of PAMT has been a concept sought by physicians treating headache and migraine since antiquity and has spawned a number of unique approaches ranging from trepanation in ancient societies to implanting garlic pods under the skin of the forehead as described in the tenth century by abou l’ouasim, to feverfew and application of poultices of millipedes and woodlice by Thomas Willis in the seventeenth century . In the modern era, PAMT begins with methysergide and the work done by Sicuteri , Friedman, Graham, and others beginning in the 1950s. Methysergide was found to have a preventative antimigraine effect but was also found to have many acute and subacute side effects as well as the longer term complications of retroperitoneal, pleuropulmonary, and cardiac fibrosis. These complications limited the use of methysergide as other PAMT agents were identified . 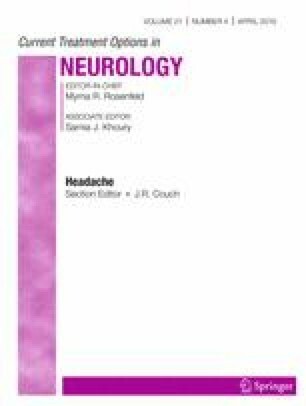 Dr. James Couch is currently serving as section editor for the Headache section of the Current Treatment Options in Neurology journal.